This was not an overly positive experience. First room allocated had hairs in the bed. Second room was better although the level of dust on the top of the fridge looked like it had NEVER been pulled out of its space and cleaned. Ashame as the staff were very helpful. The night receptionist was extremely apologetic about the first room and immediately sent someone up to clean the fridge top in the second room that we were allocated. There is no elevator so with heavy suitcases, it can be a problem. If the above issues are sorted out, it actually is a nice hotel, well located and the rooms ( for NY standards) are fairly spacious. it is nice to have a kitchenette to be able to make tea coffee and snacks. The back brick wall is a nice feature. Good value if they can get their cleaning levels up to scratch. I go to New York a lot, to drop off my daughter to her mom, I’ve stayed at various hotels in the city. I truly loved the experience of the East Village Hotel. They email you the keypad code for the entrance and your room, and that’s it, you’re good to go. No 24 hour staffing, but when staff is there they are courteous and friendly. You’re right in the heart of the East Village and you can temporarily live like a local. The room was like a little New York apartment with a kitchenette, bathroom and bed/living room. Sitting out on the fire escape at night and just watching everything was medicinal. I would advise everyone who wants an authentic New York experience to stay at this hotel. Very close to the city area, the location is perfect! The service person Afrim was very pleasant, and helped me with my luggage up the stairs. The apartment was very clean, and my room provided a nice resting space to rest my weary feet after long walks. All in all, I would definitely recommend this place! This hotel is more like a hostel. Everything was clean, but the bed + pillows seemed about 50 years old (I could feel the springs digging into my back and shoulders all night). This plus being on the 1st floor with no double-paned windows led to the worst night's sleep I've had in a long time. You can hear other guests' conversations through the walls and if anyone takes a step in the hallway or above you. They also came into my room when I had the do not disturb sign outside, which I thought was a bit weird and not a normal protocol. Overall, at this steep price I'd stay about anywhere else nearby or at an Airbnb. Will not be coming back. This hotel is awesome! Spacious and clean studio sized rooms. Comfortable beds and kitchenette. This place was just what I needed after a very long flight from Sydney Australia. The staff were super friendly and helpful, good fast WIFI. Great bed, good sized clean rooms and bathroom. Very centrally located, only a few blocks from the subway. Great restaurants and bars close by. Highly recommend this place. Would definitely stay here again as it was exceptionally reasonably priced at the time I stayed. Very sweet hotel. Suites were very well designed and equipped.The shower was a bit weak and it was a distinct disadvantage that the hotel had no elevator.However, the staff was extremely friendly and helpfull(Took our suitcases all the way to the top floor ! )and was always forthcoming with usefull information. 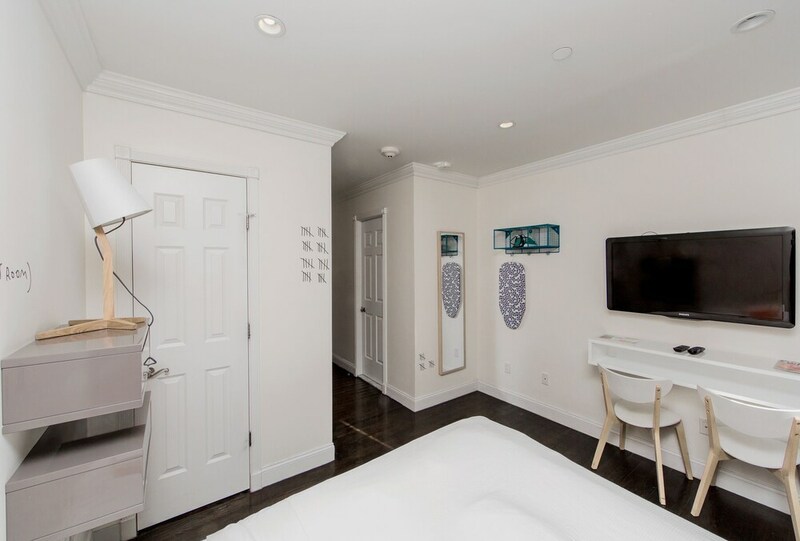 Located in East Village within 2 miles (3 km) of Empire State Building, this aparthotel is within a few miles (5 km) of other popular sights such as Times Square. The 18 rooms at this 3-star aparthotel include kitchens, refrigerators, and microwaves. Get a pick-me-up at the coffee shop/café. The apartment is individually decorated and features a kitchen with a refrigerator, a microwave, a stovetop, and a dishwasher. Guests can expect to find free WiFi and 40-inch an LCD TV with cable channels and pay movies. Pillowtop beds sport Egyptian cotton sheets and the bathroom offers a rainfall showerhead, a hair dryer, and free toiletries. Other standard amenities include a coffee maker, an ironing board, and a desk. Guests of this aparthotel enjoy features like free WiFi in public areas. The front desk has multilingual staff that can help with luggage storage, tours or tickets, and dry cleaning/laundry. The front desk is available during limited hours. This property's front desk is open daily from 8:30 AM - 10:30 PM.